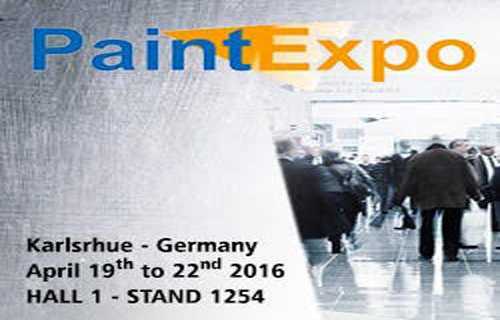 Efficient coatings technology fulfilling stricter requirements will be in abundance at PaintExpo 2016 to be held in Karlsruhe, Germany from April 19-22, 2016. The transition period for the use of chrome(VI)-containing products in the European Union (EU) will expire on September 21, 2017, which is still used in some cases for the pre-treatment of aluminum and zinc. Thus far it’s impossible to say whether or not chromium trioxide and other chromium compounds included in annex 14 of the REACH regulation will be authorized. Therefore, products based on renewable raw materials for the cleaning and pre-treatment of components made of steel, iron and aluminum will be one of the highlights at the show. The optimization of energy and resource efficiency is still a high-priority all over the world. Developments which contribute to simplifying the utilized processes play an important role in this respect. These developments, including the so-called single-coat systems, will be presented. A further trend for which solutions will be showcased involves liquid paints and powdered enamels which, in addition to their protective and decorative features, fulfill other functions as well. These include, for example, self-healing, self-cleaning, antimicrobial, temperature compensating, ice-resistant and photocatalytic paint layers. In the field of powder coating, ultra-thin powdered enamels permit significantly reduced consumption thanks to reduced layer thicknesses – as of 25µm depending on the color. Where efficient overspray scrubbing is concerned, demand is continuously increasing for dry scrubbing systems. These solutions make use of brushes, electrostatics, powder and special carton designs for the effective, energy-saving and resource-conserving scrubbing of overspray. After the steam engine, the assembly line and computer technology, with Industry 4.0 the fourth industrial revolution is targeting coating technology as well – which is actually more of an evolution based on modular, browser-based manufacturing execution systems (MES) which will be presented at PaintExpo. They network the factory throughout the entire manufacturing process (horizontally), as well as through all process levels (vertically). This permits integrated data acquisition, analysis and graphic display in real-time. Production and logistics processes are thus made fully transparent on the one hand, and data can be accessed from anywhere in the world at any time on the other hand. As a result, processes can not only be controlled, monitored an optimized from a PC at the workplace, but rather from a laptop, a tablet or smartphone at any location as well.